To fully enjoy most of the hiking in the Chisos Mountains requires spending at least one night in a back country campsite; the Lost Mine Trail is one of the shorter paths and is perhaps the best choice for a half day trip. The route passes varied scenery with views over several different sections of the mountains, and ends at a dramatic rocky ridge at 6,850 feet. 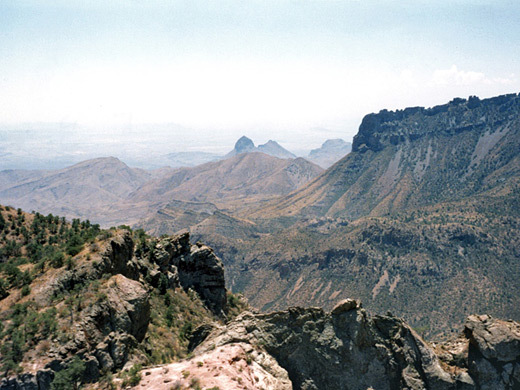 The path starts at 5,650 feet; the trailhead is along the entrance road into the mountains, just after the highpoint at Panther Pass, and before the steep winding descent into Chisos Basin. The round trip is 4.8 miles and there is a useful illustrated guide available at the carpark where the trail begins which lists 32 points of interest, mostly different types of plants and trees. 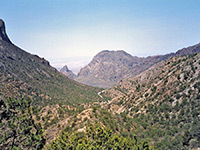 At first, the walk is along the lower slopes of Casa Grande peak, on the north-facing side of Green Gulch, a relatively sheltered valley with pine, juniper and fir trees, After 0.8 miles the path reaches a ridge at the head of the gulch; ahead lies the much larger Juniper Canyon, with the Chihuahuan desert in the east of the park visible far beyond. Even a walk just to this point is worthwhile, but most people continue. The middle third of the trail alternates between sunny, exposed land with cacti, ocotillo and lechuguilla, and more shaded patches with bushes and trees. The uphill gradient is moderate but steady, becoming quite steep as the path approaches the ridge that divides Juniper Canyon with Pine Canyon, the adjacent ravine to the north. The last section is much flatter, along the ridge which is mostly bare rock, and becomes gradually narrower, ending at a small summit around which the ground at either side falls away very steeply. There are several higher peaks around the end of the trail, including 7,535 feet Lost Mine Peak, at the far side of Pine Canyon to the north. Some of the rocks on the hillside opposite are quite colorful, hinting of hidden mineral wealth, and there are stories of a rich seam of gold being discovered in this area by Spanish settlers, then supposedly lost when all were killed by Indians. The tale is unproven and no trace of such a mine in this area has ever been found.